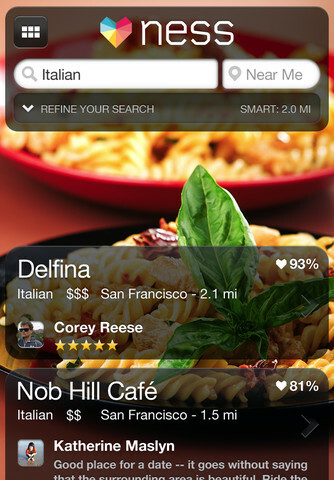 Ness is an iPhone app that makes restaurant recommendations based on your personal taste. Using a system similar to Pandora, TiVo and Netflix, Ness learns about your preferences from your Facebook and Foursquare profiles, then asks you to rate restaurants you’ve visited. Ness then compiles this info and presents you with a refreshing layout that incorporates captivating cuisine photography and a polished glossy interface. The design and fluidity of the app alone are enough to make you want to come back to it. The name Ness might throw you off at first, but it comes form the word likeness, with like as in liking things and like as in similar things. To get started you’ll need to hook into your Facebook and Foursqare profiles. Ness then brings up a few places in your area and asks you to rate them. The more you rate the better the reccomendations. The rating never stops and you can pretty much keep going all day. 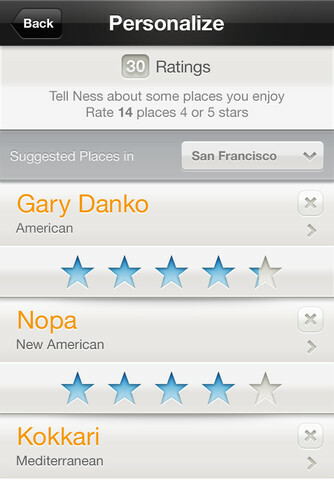 Once you’ve gotten a few dozen places rated, you’ll notice that Ness will give you better recommendations. Ness also keeps track of places your friends have reviewed or rated and blends those tips into your stack of ideas as well. Another great feature of Ness is its dynamic layout. On its main screen the Ness app lists 6 categories of restaurants and these change depending on time of day, your location and a few other factors. For example on a Sunday morning you’ll find Cafe and Brunch on the list, if that’s the kind of places you’ve been rating often. When you go into a place you’ll see its contact info plus a list of “reasons” to go or not to go to this place. Ness also predicts your “Likeness” of the place using its intelligence system. Other things taken into account besides Facebook and Foursqare are, CitySearch reviews and Twitter mentions. Ness also gives each place a “Popularity” rating and for some places it even ranks the place in its city amongst the competition. For example a local coffee shop might be the 5th most popular cafe in Los Angeles. From here you can dig deeper and view all the cafe’s on the top 5 list. If you really like a place you can save it on your Ness profile for quick access. Ness also gives you a custom search screen. You can type in any keyword and pick from a set of options like distance and price. You can also choose to hide big chains and places you’ve already rated from the results which is pretty cool. Grab the free Ness app and play around with it. It’s pretty painless and fun to browse around the app. Next time you need to think of a restaurant you’ll love, Ness will probably pleasantly surprise you. AppSafari review of Ness for iPhone was written by Joe Seifi on September 18th, 2011 and categorized under App Store, Featured, Food, Free. Page viewed 5092 times, 2 so far today. Need help on using these apps? Please read the Help Page.